SAVE THE DATES! NEIGHBORHOOD PARTY AND ELECTIONS! Music, food and get to know your neighbors and celebrate with the Sign Committee for the Neighborhood Signs. her eagle-eyed ability to locate the tiny missing washer. Volunteers needed to install our neighborhood signs this Saturday! On Tuesday evening the Beautification Committee finalized the sign installation plans for this coming Saturday, October 11th. The install day will begin bright and early at 9:00AM and we will meet at the first install site which is the island in the intersection of N. Lake Formosa and Alden Avenue. We have many jobs for volunteers that will fit within their comfort level and physical capabilities. If you are available to assist on Saturday, please RSVP to this email address – scottye@mac.com – so that I can be sure we have the proper help lined up for this project. This is going to be an exciting day where we all have the opportunity take part in making a lasting physical improvement to our neighborhood. Congratulations to all of the volunteers and committee members who helped to make this project a success. Our initial application was submitted in September of 2006 and here we are over two years later installing our signs. This is a great example of the commitment and dedication to neighborhood improvements that makes this such a great place to live. The signs are currently sitting in our garage and are absolutely beautiful. • Next steps include City of Orlando City Council approval of project on 21 April 2008, at which time check for 50% of grant will be assigned so LFNA can order the signs. • Sign price must be re-verified as the price may have increased due to the significant amount of time that has passed during City of Orlando review and approval of the LFNA application package. • The signs should be ready to put into the ground in the next 6 to 7 months timeframe. • LFNA logo, including on the website and letterhead, have been changed to match the sign design. Our neighborhood sign committee has worked hard in making our neighborhood signs become a reality. Update: 9/12/07: This past weekend, we generated the final monies needeed; $1600.00 for our Neighborhood Sign project! We have made our goal and created a buffer for paying for cement and any unforeseen expenditures. Congratulations to all! Thank You to the neighborhood for supporting this project so generously. Here is the preview of the four signs (design voted on by the membership at the April general meeting) that will be erected at the various corners of the neighborhood. Please contact Scott Evans at if you would like to help install our signs at scottye@cfl.rr.com. 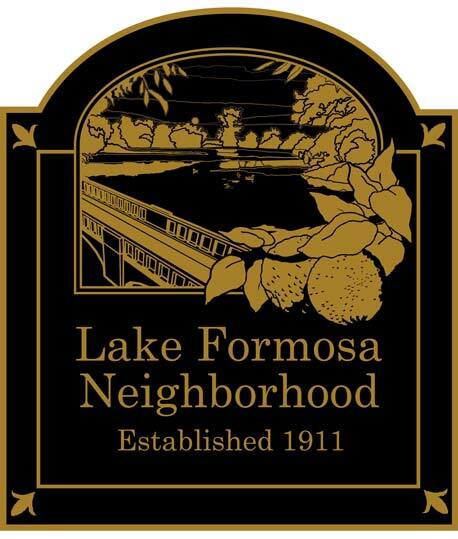 The Lake Formosa Neighborhood Association would like to thank the following “Good Neighbors” for their financial support of the Lake Formosa Neighborhood Sign Project. With the generous support of these businesses, over $5000.00 has been raised towards making our sign project a reality.